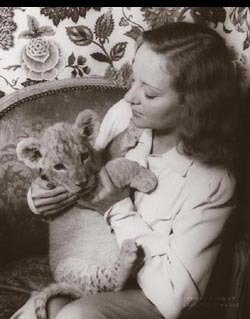 After her success in London, Bankhead went to Hollywood under contract with Paramount Pictures. They billed her as “the next Marlene Dietrich,” but all her films were mediocre. In 1936, convinced that she could “play the pants off Scarlett,” she campaigned for the role of Scarlett O’Hara in Gone with the Wind, but was denied the part. Film success came only in 1944 with Alfred Hitchcock’s Lifeboat. Her performance earned her a New York Film Critics Award. Bankhead also had mixed success on the stage. In 1937, she and then-husband John Emery staged Anthony and Cleopatra, with Carl Van Vechten’s wife Fania Marinoff playing the role of Charmian. The play garnered Bankhead her worst reviews ever, including, “Tallulah Bankhead barged down the Nile last night as Cleopatra—and sank.” In true Bankhead fashion, she was undaunted, claiming, “As far as I’m concerned Shakespeare should have left Anthony and Cleopatra in Plutarch, where he found them.” In 1939, however, she had a hit as Regina Giddens in Lillian Helman’s The Little Foxes. Her performance has been called “a theatrical milestone.” In 1942, she had her second great success in Thornton Wilder’s The Skin of Our Teeth. Production was often difficult as there was considerable tension between Bankhead, her producers, and her fellow actors.